Promotes a positive view of recycling and suggests practical ways that young children can care for their environment. 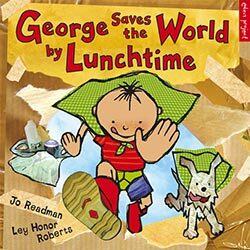 George, who loves dressing up as a superhero, is keen to save the world by lunchtime, but isn’t sure how to go about it. His grandfather offers some more attainable suggestions for looking after the planet, including visiting the recycling bank, buying local food, using less electricity and supporting charity shops. The simple and positive ideas suggested in this book will appeal to young children without daunting them.